Entrepreneur Elon Musk's dream of an express tunnel transit system could finally become a reality in Las Vegas after major setbacks in other cities. Las Vegas' tourism agency announced Wednesday it is recommending that an enterprise backed by the divisive billionaire receive a contract to build and operate an underground tunnel system through which autonomous electric vehicles would whisk people around a mega convention center, and in the future, possibly the city's famous casino-filled corridor. If approved, the system of just over a mile long would debut by January 2021 at the facility, which hosts more than 1 million people every year. The Musk-owned The Boring Company would build the project costing from $35 million to $55 million. It's different from his beleaguered efforts to build underground tunnel systems in other cities because Musk will be paid for it if the contract is approved. Projects in Los Angeles and Chicago have drawn opposition and skepticism from residents and officials about whether they will actually open. "It's really innovative. I think it will be an attraction in and of itself, frankly," Steve Hill, president and CEO of the Las Vegas Convention and Visitors Authority, told The Associated Press. Details of the project have not been finalized. But Hill said the system will probably have three or four stations, each situated at entrances to the convention center's halls. 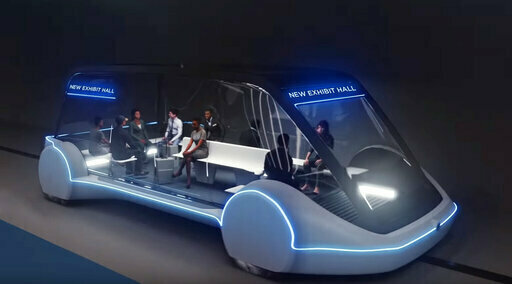 People would be carried to the hall of their choice in electric vehicles moving through parallel tunnels, each running in one direction.